That is because they are easy to use, easy to purchase, and adorable once completed. Our pots are from Italy so you are starting with a great base for any craft project. The clay is smooth, nice and compact and the best made anywhere. Give it a go and let us know how you did! 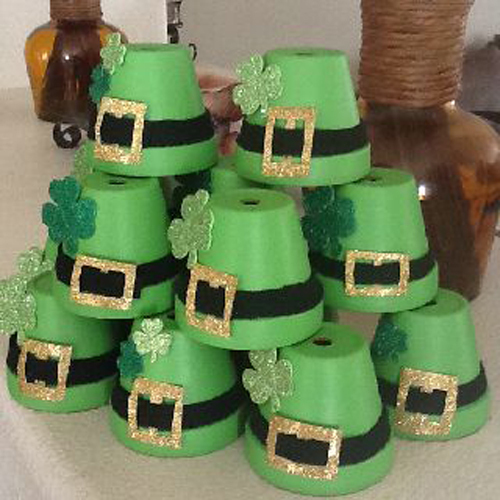 Make a stack of Good luck pot hats for a party. Each guest will get to take one home as a party favor. Paint the pots with green paint, wrap a black band around the base with felt. Put on a buckle made of felt and gold glitter and add a glitter shamrock. Adorable gift idea. What a clever way to set your St Patrick Day feast. Each place setting gets their own decorated terracotta pot to take home. Paint the pots green, wrap a ribbon around the rim and glue on a gem stone for a buckle. 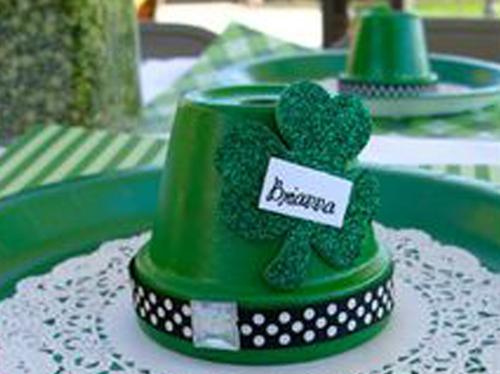 Add a glitter shamrock and glue on each guest name. These pots are really cute. This clay pot craft idea is really for those of you who want a challenge. It's more complicated but as you can see well worth the work. This project needs 2 clay pots and one clay saucer. The base is a flower pot turned upside down, painted and decorated with green felt designs. 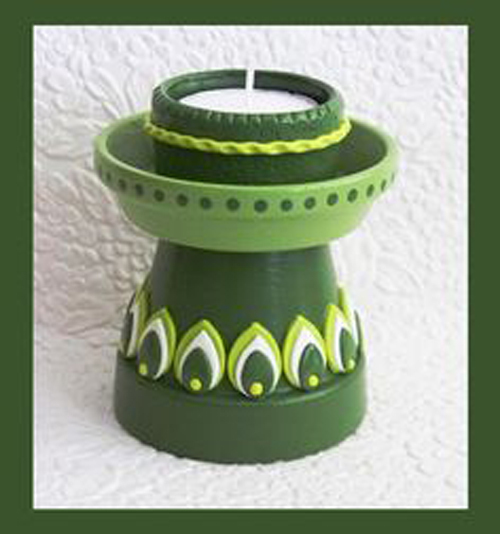 The next is the saucer painted green and inside the pot saucer is the final pot that is holding the candle. Use as a centerpiece of your St Patty's Day Celebration. Read more.....March Madness....things to do around your garden.